The Moment Condensed Chuo Gyorui staff normally pass the Tokyo Metropolitan Government auctioneer qualification test 2 years after entering the company. 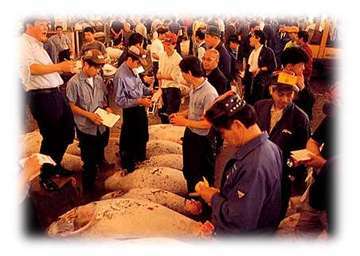 Most of the 30 staff in the Tuna Department are qualified auctioneer. However, only 10 perform the auction duties because more skill is required than is gained from the basic qualification. The tuna auctioneer is the star of the fish market. Surrounded by buyeres, he cites figures in a unique rhythm while the buyers use teyari hand signs to offer prices based on their prebidding inspections. The highest price wins the bid and all attention is focussed on the auctioneer. No oversight or mistake is allowed and the game is played in real earnest each day for every one of hundreds of tuna. The auction is really an artistic sight. Although the voice and rhythm differ from auctioneer to auctioneer, the show is surely the auctioneer's stage. The buyers say a skilled auctioneer who can bring many tuna and people together has some hidden charm. A good auction is impossible unless the auctioneer can gather many buyers. The most important ability of a auctioneer is the ability to collect and analyze information. If an auctioneer cannot provide shippers with accurate estimates of market prices, he will not get their product to sell. For example, Jiro Matsuyama (Manager of the 1st Fishing Boat Section of the Tuna Department), an auctioneer for frozen southern bluefin tuna, tells shippers the high, low, and average prices for tuna received as well as the prices for the entire market. In addition,he analyzes tomorrow's market trends,including estimates of frozen tuna arriving at Tsukiji,condition of fresh tuna market,weather on fishing grounds, information on tuna that are selling well, etc. He also tells shippers whether tuna prices indicated by them are reasonable, etc. If his forecast is correct, the shippers trust him and are always ready to ship to us,but if it is wrong, our ability to collect tuna decreases because the shippers change their selling method,pricing, destination, etc. Therefore, most of an auctioneer's day is spent collecting and analyzing information. Matsuyama says, "If an auctioneer's forecasts are right 4 or 5 days a week, he can be called a very good businessman." Auction is a mechanism to deliver products to buyers and maintain the supply and demand balance. However, it is very difficult to match the price wishes of the shipper, who wants to sell as high as possible, with buyer, who wants to buy as low as possible. The auctioneer tries to satisfy both parties using his abilities. Although it is difficult to completely satisfy both, the auction is successful if they obtain the same saitsfaction. Although the price of each tuna is determined in less than 10 seconds,actually the price is based on the huge amount of time spent by the auctioneer collecting and analyzing information. "All our efforts are condensed into this moment and it is when we are really happy." says Matsuyama.